On October 23, 2018, President Trump signed into law the America’s Water Infrastructure Act of 2018 (AWIA), Public Law No. 115-270, a comprehensive water resources bill that includes provisions specifically targeted to promote new hydropower development. The AWIA includes a package of hydropower bills that were previously approved by the U.S. House or Senate but were never enacted into law. The AWIA is composed of five major categories of hydropower reform: (1) extending preliminary permit terms and start of construction deadlines for new construction projects; (2) promoting new, small conduit hydropower facilities; (3) promoting hydropower development at existing nonpowered dams; (4) promoting development of closed-loop pumped storage projects; and (5) incentivizing investments and modernization projects at existing hydropower facilities. First, the AWIA amends the Federal Power Act (FPA) to authorize the Federal Energy Regulatory Commission (FERC) to issue preliminary permits for up to four years, instead of the previous three-year limit. The legislation also authorizes FERC to extend a preliminary permit once for no more than four years, as opposed to the previous two-year limit, and authorizes FERC to issue a new permit after the end of an extension under extraordinary circumstances. With regard to newly licensed projects, the AWIA authorizes FERC to extend the time a licensee has to commence construction under a license for up to eight years beyond the two years allotted under the license. Prior to enactment of the AWIA, FERC could extend the license once for no more than two years. This increases the total possible time to commence construction of a newly licensed project from four years to 10. The AWIA also extends the date by which private licensees of unconstructed projects must begin paying annual charges by up to 10 years after license issuance. These changes should facilitate developers’ ability to take projects from feasibility investigation to project completion without the recurring fear of expiring permits and frequent need for special legislation to extend license construction deadlines. Second, the AWIA directs FERC to convene an interagency task force to establish an expedited licensing process for certain projects at existing, non-powered dams. Qualifying projects must not have been previously authorized for hydropower and must use for generation the withdrawals, diversions, releases, or flows from an existing dam, dike, embankment, or other barrier that is or was operated for the control, release, or distribution of water for agricultural, municipal, navigational, industrial, commercial, environmental, recreational, aesthetic, drinking water, or flood control purposes. Qualifying projects also must not propose to materially change the operations of the nonpowered dam. The legislation envisions that FERC would issue a licensing decision within two years of receipt of a completed license application. Third, the AWIA directs FERC to issue a rule establishing an expedited process for licensing closed-loop pumped storage projects. Like the provisions for expedited licensing of projects at existing nonpowered dams, the legislation requires FERC to convene an interagency task force to coordinate the regulatory authorizations required to construct and operate closed-loop pumped storage projects. Although leaving to FERC to develop a definition for “closed-loop pumped storage,” qualifying pumped storage projects must cause little to no change to existing surface and groundwater flows and uses and be unlikely to adversely affect species listed as threatened or endangered under the Endangered Species Act (ESA). This would appear to narrow the class of qualifying projects considerably. The legislation envisions that FERC would issue a licensing decision within two years of receipt of a completed license application. Fourth, the AWIA amends FERC’s qualifying conduit process by reducing the time by which a facility is deemed a qualifying conduit facility from 45 to 30 days after filing a notice of intent to construct such a facility, and expands the maximum capacity of such facilities from 5 to 40 MWs. Last, the AWIA directs FERC, when determining the term of a new license for an existing project, to give project-related investments by the licensee under the existing license, including rehabilitation or replacement of major equipment, equal weight with proposed investments under the new license. This is a modification to FERC’s license term policy issued in 2017, which exempts all “maintenance measures” from consideration toward a new license term. The AWIA allows a licensee to seek a determination from FERC, within 60 days, on whether any planned, ongoing, or completed investment will meet the criteria to be considered by FERC in determining a new license term. For more information on the AWIA legislation, please see our October 24, 2018 alert. On Monday, October 22, 2018, Kevin McIntyre resigned his position as Chairman of FERC, citing ongoing health issues. McIntyre was sworn in as Chairman of the Commission on December 7, 2017. President Trump has appointed Commissioner Neil Chatterjee to replace McIntyre as Chairman. McIntyre will retain his position as a FERC Commissioner. Commissioners serve five-year terms that are staggered, and no more than three commissioners may be from the same political party. While Republican Commissioner Robert Powelson resigned in August 2018, there remains a quorum of sitting commissioners to conduct agency business. Earlier this month, Trump nominated Bernard McNamee, currently the Executive Director of the Office of Policy at the Department of Energy, to replace Powelson. McNamee’s confirmation hearing before the Senate Committee on Energy and Natural Resources is scheduled for November 15, 2018. On October 30, 2018, FERC issued a notice of intent to prepare an environmental impact statement (EIS) for the Coosa River Project in Alabama. The notice was issued in response to the July 6, 2018 decision in American Rivers v. FERC, where the U.S. Court of Appeals for the D.C. Circuit vacated the new license for the project issued by FERC in 2013 and remanded the case to FERC. As explained in our August 2018 newsletter, the court found that the U.S. Fish and Wildlife Service (FWS) violated the ESA in establishing the environmental baseline without considering the degradation to the environment caused by the project’s past operations and continuing impacts. The court also found that FWS failed to show a rational connection between its finding that the proposed action could result in up to 100 percent incidental take of listed species, and its conclusion that this level of take was not likely to result in jeopardy to these listed species. With respect to FERC’s actions in the relicensing, the court found that FERC violated NEPA by failing to prepare an EIS despite significant adverse project impacts on fish passage and dissolved oxygen. The court also found that FERC’s cumulative impact analysis was flawed because it did not factor the original construction of the dams into the analysis. The court also criticized FERC’s acceptance of studies and data provided by the licensee, the use of desktop entrainment studies rather than site specific studies, and FERC’s allowing the licensee to submit plans to implement license conditions after license issuance. FERC’s notice in response to the remand order states that FERC staff will prepare draft and final EISs, which will be focused on the issues identified by the court as requiring further analyses. For the resource areas not the subject of the opinion, the EIS will either include or incorporate by reference the analysis in the final Environmental Assessment issued in support of the vacated new license order. The notice further states that FERC will conduct scoping on the issues to be addressed in the EIS by issuing a scoping document for comment, and does not anticipate holding public or agency scoping meetings. On October 22, 2018, a number of trade associations and FERC licensees filed an amicus brief with the U.S. Court of Appeals for the Ninth Circuit (Ninth Circuit) in Friends of the River v. National Marine Fisheries Service, et al., No. 18-15623. In the case, Friends of the River (FOR) has appealed a decision of the U.S. District Court for the Eastern District of California (District Court) holding that the U.S. Army Corps of Engineers (Corps) did not act arbitrarily and capriciously when it limited its ESA section 7 review to Corps activities where the Corps has discretion and excluded from its ESA review the effects of the ongoing existence of two Corps dams. The Corps operates and maintains two dams on California’s Yuba River, which the National Marine Fisheries Service (NMFS) designated as critical habitat for certain ESA listed salmonids and sturgeon. The Corps consulted with NMFS regarding effects of the Corps’ projects on the listed species. Capping several years of disputes and litigation regarding this matter, the District Court upheld a NMFS Biological Opinion and letter of concurrence, holding that the Corps and NMFS properly treated the existence of the two dams as part of the environmental baseline for ESA consultation and, because the Corps has no discretion as to the existence of the dams, it cannot be liable for ESA section 9 “take” of listed species resulting from the mere existence of the dams. The three primary issues on which the hydropower industry’s amicus brief focused were: (1) FOR’s argument in the Ninth Circuit that the environmental baseline against which the effects of the proposed federal action should be measured under ESA section 7 should not include the dams in place, but rather the dams’ continued existence should be treated as part of the proposed action; (2) FOR’s attempt to broaden the scope of the proposed action beyond the Corps’ limited discretion to maintain the dams to include actions such as fish passage and dam removal that the Corps has not been authorized by Congress to take; and (3) FOR’s allegation that the dams’ very existence causes a “take” of listed species in violation of section 9 of the ESA by blocking fish migration and otherwise modifying habitat in the river. 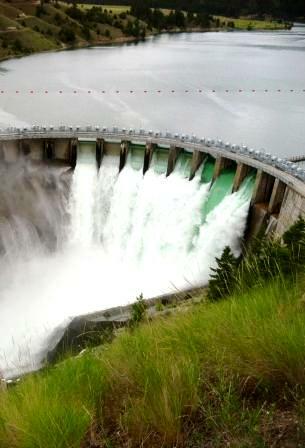 The amicus brief argued, in contrast, that the effects of the construction and ongoing existence of a dam are included in the environmental baseline for section 7 analysis and are not part of the proposed action, that the ESA does not expand a federal action agency’s discretion or authority beyond what is provided by its authorizing statute, and that “take” under section 9 can only result from discretionary, affirmative actions, not from the passive existence of a dam. The hydropower industry amicus brief was prepared by Van Ness Feldman. On September 10, 2018, the Corps issued Engineering Circular (EC) 1165-2-220, Policy and Procedural Guidance for Processing Requests to Alter U.S. Army Corps of Engineers Civil Works Projects Pursuant to 33 U.S.C. § 408 (Final EC). The Final EC replaces existing guidance on the permission process required by section 14 of the Rivers and Harbors Act of 1899 (RHA), as amended and codified in 33 U.S.C. § 408 (Section 408). New hydroelectric projects located at Corps facilities and modifications to existing projects require a Section 408 permit. The Corps may grant such permission if it determines the alteration proposed will not be “injurious to the public interest” and “will not impair the usefulness” of the civil works project. Program Governance. The Corps commits to conduct an internal audit to examine whether Section 408 is being implemented consistently and will create a public database to enable permission requesters to track the status of their requests. The Final EC, like the Draft EC, also recognizes that public and private entities may fund Section 408 review, subject to certain conditions. The Final EC requires the Corps to coordinate the Section 408 process with other Corps regulatory review processes (such as RHA section 10 (construction in navigable waters) and Clean Water Act section 404 (dredge and fill permits)), indicating that one document should be developed to cover all authorizations. It also creates new appendices to EC 1165-2-220 with more detailed processes and standard conditions to improve consistency and efficiency. The Final EC adopts the Draft EC proposal to end headquarters review of Section 408 permissions for non-federal hydroelectric projects by delegating the final decision to Division Commanders, who may further delegate all of the process except the final decision to District Commanders or their designees. Section 408 Applicability. The Final EC clarifies that the geographical scope of the Section 408 process applies to lands and real property interests required for a Corps project, to alterations to submerged lands and waters occupied or used by a Corps project, and to alterations that cross over or under a federal navigation channel when the alteration is also subject to RHA section 10. The Final EC recognizes that the requirements of Section 408 may be fulfilled by another process. For example, where a project requires a real estate outgrant—authorization to use real property managed by the Corps—or an RHA section 10 permit with the same scope and jurisdiction as a Section 408 permission, a separate Section 408 permission is not required. The Draft EC proposed that geotechnical exploration which requires permission under Section 408 should be addressed in a standalone Section 408 request separate from the request for the project as a whole. However, the Final EC removes this requirement. Procedures. The Final EC adopts new procedural options for seeking a Section 408 permission. Under the previous guidance, requesters had the option to seek a single-phase review, where all necessary information is submitted at once, or a categorical review, where the Corps analyzes impacts and environmental compliance in advance for a common category of activities. To add flexibility, the Final EC allows for a multi-phased review in which the requester submits information at each design milestone, with the information being cumulative, resulting in a complete request when the final milestone is reached. The Final EC also removes the requirement that plans and specifications be at least 60% complete to initiate the review process. Instead, the district will use its best professional judgment to determine the appropriate level of detail needed to make a on a case-specific basis. The Final EC, like the Draft EC, incorporates new timelines for a Section 408 review that are provided in the Water Resources Development Act of 2016, including a requirement to act on the request with 90 days of determining that it is complete, although the Corps may extend the deadline subject to certain reporting requirements. For more information on the Final EC, see our October 11, 2018 alert. On October 19, 2018, President Trump issued a memorandum directing the Secretaries of the Departments of the Interior and Commerce (the Secretaries) to take several measures intended to reduce regulatory burdens and foster more efficient decision-making in connection with water resources infrastructure in the western United States. Section 2 requires the Secretaries to identify major infrastructure projects in California for which their agencies have joint responsibility under the ESA or individual responsibility under the National Environmental Policy Act and, for each project: (1) identify potentially burdensome regulations and procedures; (2) develop a plan to suspend, revise, or rescind any regulations or procedures that unduly burden the project; and (3) develop a timeline to complete environmental compliance for the identified projects. Section 3 requires the Secretaries to develop an action plan to improve information and modeling capabilities related to water availability and water infrastructure projects. Section 4 requires the Secretary of Interior to direct appropriate bureaus within the Department to provide for the expanded use of technology to improve the accuracy and reliability of water and power deliveries. Section 5 requires the Secretaries, to the extent they participate in licensing of hydroelectric projects by FERC, to give appropriate consideration to any relevant information available to them in locally developed plans where such consideration is consistent with the best available information. Section 6 directs the Secretaries, along with the Secretary of Energy and the Assistant Secretary of the Army for Civil Works, to develop a schedule to complete the Columbia River System Operations Environmental Impact Statement and associated Biological Opinion due by 2020, and submit the schedule to the Chairman of the Council on Environmental Quality. The professionals at Van Ness Feldman possess decades of experience covering every aspect of hydroelectric development, ranging from licensing, environmental permitting, regulatory compliance, litigation, transmission and rates, public policy, transactions and land use planning. If you would like additional information on the issues touched upon in this newsletter, please contact any member of the firm’s hydroelectric practice.